Absorbs up to 10 times its own weight in water! The SONAX Microfiber Drying Towel is an incredibly absorbent drying towel that is capable of absorbing TEN TIMES its own weight. The SONAX Microfiber Drying Towel is made of an impressively soft 85/15 polyester and polyamide blend and when combined with the rounded corners and seamed edges and you can rest assured that your car’s paint will never suffer a scratch when you use the SONAX Microfiber Drying Towel! Towel drying your car can be a long and annoying process. 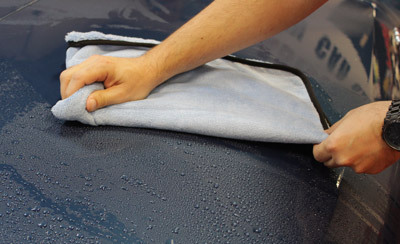 You have to frequently switch to a new, dry towel to ensure that the water on your car is actually being absorbed. Thankfully the SONAX Microfiber Drying Towel can absorb up to ten times its weight in water, meaning you’ll find yourself swapping towels much less often! SONAX Microfiber Drying Towel can absorb up to ten times its weight in water! Another large concern when towel drying your car is the constant threat of scratches during the process. The majority of the drying towels on the market today aren’t designed with this problem in mind. The SONAX Microfiber Drying Towel, however, is designed specifically to minimize the risk of scratches as much as possible! The SONAX Microfiber Drying Towel is made up of an 85/15 polyester and polyamide blend, making it one of the softest towels on the market today! On top of that, the SONAX Microfiber Drying Towel has seamed edges and rounded corners! This ensures that the edges or corners of the towels don’t dig into your car’s perfect polished surface during the drying process. Simply use one side of the towel to absorb the majority of the water from the surface. Then use the other side of the towel to wipe the surface completely dry! Do not wash in temperatures above 140°F (60°C).